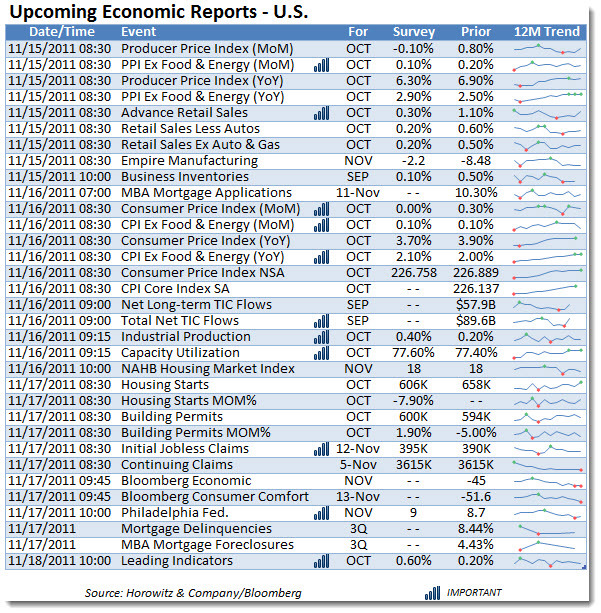 Last week there were few economic reports in focus. That was fine as far as market participants (bulls) were concerned. But this week is an entirely different story. As most are looking to the FED to continue with their easy money policy, the PPI and CPI numbers will be a confirmation (or not) of the over hyped worry over rampant inflation. Even as record levels of stimulus have been pushed into global economies over the past to years, the deep hole that they are filling continues to consume everything that goes into it for developed economies. If that were not the case, inflation would be a concerning factor and the FED may not be as willing to continue their ZIRP program for long. Also watch for the manufacturing numbers as these will be part of the estimates for GDP and have been surprisingly weak lately. Industrial production will also be in focus since this has been tied to profitability. Oh, and if the list below is not enough, Italy, Greece and France should provide some additional volatility….